Windows do more than just bring in light and provide a view of the outdoors. Windows create an architectural aspect of your home that can be custom designed to fit an existing décor or create a whole new look. Few window styles add beauty to both the interior and exterior of a home like superior quality Renewal® picture windows. Renewal® picture windows are available in a wide selection of colors and finishes. When you work with Renewal® by Andersen of Greater Philadelphia, our design team will help your to design a picture window that truly speaks to your sense of style. 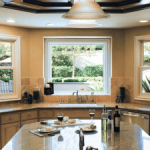 We can combine two or more window styles to create picture windows that boast designs unique to your home. And each window we install is produced with energy efficiency and weatherability in mind, meaning your picture window will be able to stand up to even the harshest Pennsylvania weather while maintaining a draft-free seal. The strength of your picture windows will stem from the Fibrex® material used in their production. Fibrex® is more durable and sustainable than vinyl, and when combined with Low-E glass it provides homeowners with an unmatched level of energy efficiency. When you install picture windows from Renewal® by Andersen of Greater Philadelphia, in just one step your home will be more comfortable, affordable, and beautiful. And as with all of the products we install, your picture windows will be backed by our industry-leading warranties. To learn more about picture windows, we encourage you to call Renewal® by Andersen of Greater Philadelphia today at 610-563-2190. We will help you to schedule a free no obligation window consultation with our factory trained window experts.